Well the time is flying especially down at Holme Manor we have been up to so many different things that we are fast approaching the Summer. We have welcomed new residents and staff members and everyone is settling in nicely. Lots of great things have been happening at the Manor and our residents have been very busy trying to keep up with everything. Silvershed has been our Monday morning routine since September 2016 with our residents attending weekly. 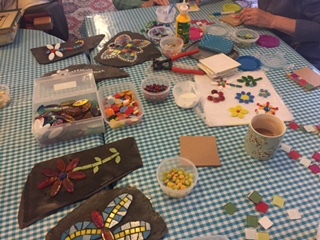 The sessions have provided a huge success and we are so pleased that they can now continue till the end of July when hopefully funding will again be available for this wonderful project to continue. Tor View School have been a great supporter of this project and a huge thanks goes out to them. There have been so many themes we cannot pick the best just loved every minute of them. An event is being organised to help raise funds on the 2nd June at St Mary's Chambers In Rawtenstall. If you require further information contact the office or Pearsons Cafe in Helmshore. Hopefully if funded is found also then Silvershed will be going on the road too visiting many homes across the valley and into Burnley too. Luckly we have applied to be part of a CCG funding project Playlist for Life. We have been chosen as part of 4 care homes taking part. We have attended the training and the project will start in May. We will be working closely with residents and family members making playlist for our residents. These will be on MP3 players with headphones so that family or staff involved can listen to the music together. This project has been proven to make a difference to individuals lives. Please ask for further information as this will be an ongoing project. Our other project is called The Storybox Project. Again we have secured this project and includes training and facilitated sessions and then also resources for us to use with our residents on themes. This will run June - November. This will take place at the manor and you can get involved just watch out for the dates. Using poetry, art and activities to engage our residents. The manor is undergoing some changes as you will have noticed with new curtains and carpets in both our lounges so this is looking wonderful now and hope that you like it too. Hopefully with some nice weather coming we can get outside in the courtyard or into the summer house and gardens. Our new look kitchen is finished and looking great and also helping our fabulous chefs create some traditional home cooked food. Thank you for your support whilst these changes were happening. 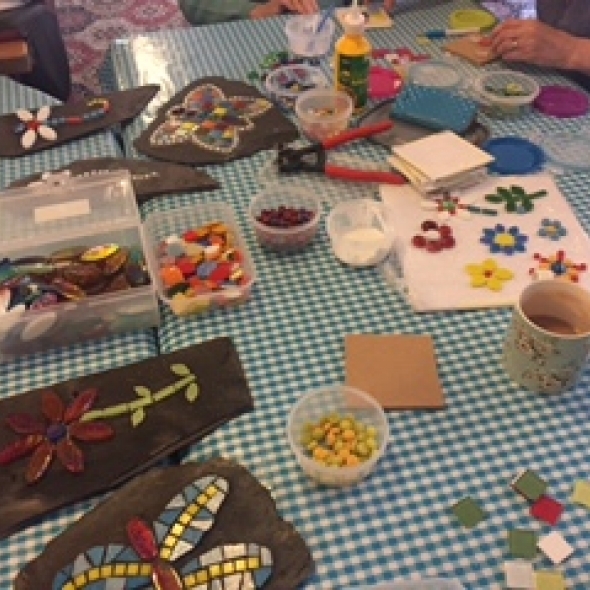 We have been learning and trying lots of new craft activities and these seem to going down very well with our residents and making our home feel bright and homely. If you have any ideas please let us know. We have had three birthdays this month and we have celebrated this with our wonderful cakes look out on the birthday board for our next set of birthdays in May. On the 18th May we are taking part in Dementia Awareness Week and riding on the East Lancs Railway trip again Bury to Rawtenstall and return with a wonderful lunch. This trip was a huge success last year so very excited to be going again. Also in the afternoon of the 18th May Cats in PJs is coming to perform one of her amazing shows so don't miss out 2 pm start all welcome. New displays are coming this week so watch those boards down at the Manor this one may just surprise you! !